Arindam Banerjee is a Professor of Marketing at IIM Ahmedabad. 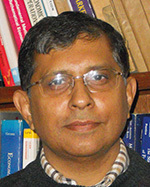 He has been associated with the institute for the past 18 years. Prior to his joining the institute, he was an analytics specialist in a management consulting firm in Chicago, IL. Before that he worked at AC Nielsen Corporation, United States, servicing the analytics requirement for Philip Morris Inc., where he gained market research experience. At IIM Ahmedabad, he teaches, consults and researches in marketing analytics and strategy. He has been involved in setting up the offshore analytics operations for a global bank in India and has been an analytics mentor for several other organizations. He is a PhD in marketing science from the State University of New York at Buffalo and a PGDM from IIM Lucknow. He was listed in the 10 Most Prominent Analytics Academicians in India, 2017 by Analytics India Magazine. He is also the author of Management Essentials: A Recipe for Business Success published by SAGE in 2013.